If you’re a forklift driver, there’s a pretty good chance you’ve been involved in an accident. After all, about 1 of every 10 forklifts this year will be involved in some disaster on the job. Thankfully, most accidents are not serious, just small fender-benders and other crashes. You don’t have to look very hard to find forklift accidents. YouTube has many videos, and there are stories in the news every day about accidents in the United States and all over the world. Lifting a load off a truck or dock, and lowering the load while backing up without looking. This can cause the load to “bottom out” and cause serious damage or bodily injuries. Overloading a shelf or bay in a warehouse. Some structures can only handle so much weight. If a forklift driver puts too much weight or too many pallets on a rack, there’s a good chance an accident will happen. Driving too fast. If a forklift operator is moving too quickly in a dock or warehouse – especially around corners and other blind spots – accidents will occur. Lifting a heavy load too high. A forklift’s stability is affected by the load it’s carrying, and that’s certainly true when a weight is lifted beyond the forklift’s normal capacity. Bumping into shelves. Even close to the ground, a forklift’s load can cause problems. If a pallet or other heavy weight hits a shelf leg or base, the entire shelf system can come crashing down. CertifyMe.net can help avoid those foolish forklift accidents. 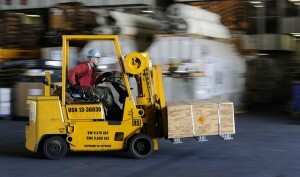 Our training and instruction has been used by many companies to properly certify and train forklift drivers. Well-known firms like Verizon, U-Haul, Penske and Harley-Davidson count on CertifyMe.net for OSHA-compliant training. Our courses can be taken online – anytime and anywhere! If you need your forklift fleet or even a single operator trained, CertifyMe.net is here to help. We can be reached by phone at (888) 699-4800, or on our contact page. Give us a call or send an email to schedule classes now.